In many gyms, the rowing machine, otherwise known as the ergometer, has turned into a dinosaur gathering dust in the corner, as gym goers pass it by opting for the treadmill or weight machine to reach their fitness goals. Little do they know that a rowing machine is an excellent tool in burning significant calories and toning virtually every major muscle group in the body. Have you been guilty of ignoring this fantastic device? Don’t worry. It’s understandable. Very few people know how to use a rowing machine. This can be intimidating and make you shy away from using it. After you are finished reading this article, you will be able to get on this wonder machine and use it properly to burn up to 600 calories per hour. Good luck getting those numbers from a treadmill! Because you know this insider information, you will be able to see great results in the shape of your body. The good news is, it’s so easy, even the blind can do it! A study done on people who are visually impaired showed that using the rowing machine for six weeks, five days a week helped with their total body fat and muscle definition. Finally, a better way to shed body fat! Let’s get started. Properly Calibrated Rowing Machine (we’ll get to how to calibrate it later). Good supportive Shoes with laces short. Tight fitting clothing to keep from getting anything caught in the machine. Hydrate well before and after with water or your gym drink of choice. This step is quite easy. There are different levels of resistance that can be used in a rowing machine. Since you are most likely a beginner, you will want to use a lower strength setting to begin. There should be a handle next to the wheel of the rowing machine with numbers 1-10. This is called the damper setting. Set the handle somewhere near the three. As you begin your workout, you can adjust this to your needs. Aim to be able to maintain between 20-25 strokes per minute. 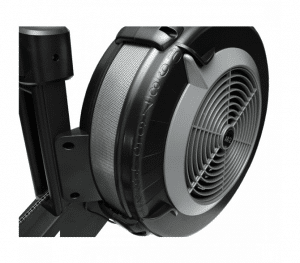 This is an example of the damper setting on a xebex brand rowing machine. 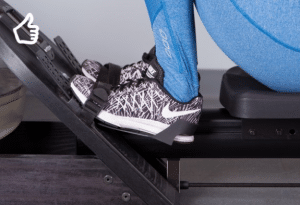 To keep your feet from falling out of the strap during a rowing workout, you need to fasten your feet into the belts of the footplate securely. Place the straps over the top of your foot, not your toes. Tighten it until there is no give. Your heels should be touching the bottom of the foot plate. This is an excellent picture of how your feet should look when done. 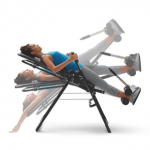 The four different positions of the proper way of how to use a rowing machine are named which is helpful. The first position, how you begin your workout, is called “the finish”. I know that seems backward to begin with the finish but trust me, this will work. To get into the finish position, you need to have your legs wholly extended, back slightly leaning back, and have a firm grip on the handlebar, or oar. The oar should be in towards your chest at about the bottom of your ribs, with your elbows pointing out to the sides. In all these positions, your back should be straight, and your shoulders should not be hunched. This can cause back pain after your workout if you have poor posture during your rowing. The second step of a row is called “arms away”, which is pretty self-explanatory. All you do is extend your arms away from your chest. There should be no movement in the torso. Keep it straight and slightly leaned back. Your legs should not move, either. This move is all in the elbows. The next move is called “bodies over”. To complete this move, you should hinge at the hip and lean your torso forward until your hands are over your feet. Your knees should not bend; neither should your elbows. Maintain a straight and relaxed back. To get into the catch, you need to bend your knees, making sure to keep them in and not allow them to drop to the sides. Your knees shouldn’t be touching either. There should be a natural gap between them. Your arms should remain extended, and they should be on either side of your knees. Your back should stay straight, and your calves should be perpendicular to the ground. The next step is the power to move. This is called the driver. We are about to reverse the positions that we began with. Pushing off with your legs first, begin to extend them back to the beginning position. About halfway through the leg extension, you should start to lean your torso back and bring the oar in towards your chest. Your elbows should be pointing out, your legs wholly extended, and your torso is slightly leaning back. Now we are back to where we began. To get a good sense of the posture and form of rowing, repeat these steps slowly and methodically until you feel comfortable with the sequence. Once you feel like your body has learned the moves, you can begin to increase your pace and power. To burn 600 calories in an hour, you should be rowing at a rate of 500 meters in 2 minutes. This number can change depending on your age, weight, or gender but it is an average. The video below will break down each step and show you what the repeated sequence should look like. Well, I hope you liked this tutorial on how to use a rowing machine. As I said, this machine is a great way to burn calories and if used right, will help you reach your weight loss goals. Let me know what you thought in the comments below. If you enjoyed this article and found it useful, please share it with your friends!